Heat oil and 1 tablespoon butter in a large, heavy skillet over medium-high heat. Add onions and sugar and cook, stirring once or twice, until well browned, about 10 minutes. Turn heat to low; continue to cook, stirring occasionally, until very soft, about 10 minutes. Remove half the onions and set aside. Add broth or water to the pan and bring to a boil. Cook over high heat, scraping bottom of pan, for 10 minutes. Season to taste with salt and pepper. Cook pasta in boiling salted water until a little underdone, and drain. Add to broth; simmer for 2 to 3 minutes. Add greens; cook, covered, until wilted, about 1 minute. Stir in additional tablespoon of butter, if desired. 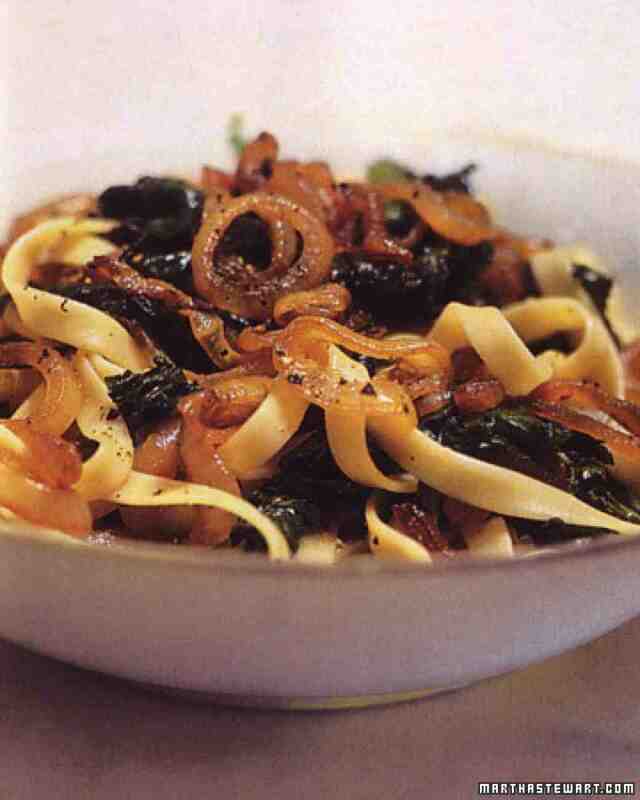 Divide among 4 shallow bowls, garnish with reserved onions, and serve.